I came up with this pulled pork taco recipe years ago and let me tell you they are absolutely epic. I actually kinda forgot about the recipe until I was going through one of my old hand written recipe binders and pulled (pun not intended) this gem back out again. Dry rubbed, slow braised and perfectly pulled they are the impeccable combination of sweet and spicy, topped with red onion and fresh purple cabbage for crunch, sliced avocado for creaminess and my favourite cilantro and chipotle aioli. The crisped cheese corn tortilla shell is optional (you can just grill up corn tortillas without the cheese if you prefer) but I highly recommend that extra step! The rub takes a whole 2 minutes to throw together, the pork is then left in the fridge overnight, thrown into the oven the next afternoon and 5 hours later you have the most delectable pulled pork, drizzled with a little honey and broiled for a couple more minutes and pulled pork taco heaven awaits you. 5 hours may seem like a daunting cook time but seriously you throw the crock in the oven and literally don’t have to do anything else expect grate a little cabbage, make a quick aioli and slice a little avocado. *note: depending on the size of your roast you will not need to use all of the rub. For 1-2 pound roast use half the mixture (you can store the rest in a glass jar for future tacos), for a 3-4 pound roast I would use all of the rub. In a small bowl mix all of the spices together. Rub onto the pork shoulder, wrap in saran and place in a cocotte with the lid on. Leave in the fridge overnight. The next day (5 hours before you want to eat), preheat the oven to 350 degrees. Unwrap the pork and place back into the cocotte, fill with water until the pork shoulder is about 3/4 emerged. Throw the sprigs of oregano into the pot and cover. Place into the oven for 5 hours, basting the pork every two hours. If you water seems to be evaporating you can add a little more as needed. Once the pork is cooked, line a baking sheet with parchment paper. Place the pork on the parchment paper (do not discard the juices) and pull apart with two forks. Pour the juices over and then drizzle with about half a cup of honey (more or less depending on the size of your roast, you just want to drizzle a light layer of honey all over the pork). Place under broil for 5-8 minutes or so. You can either serve the tacos with warm corn or flour tortillas, my favourite is corn tortillas crisped up with a little cheese. To do, warm a cast iron pan on low - medium heat. 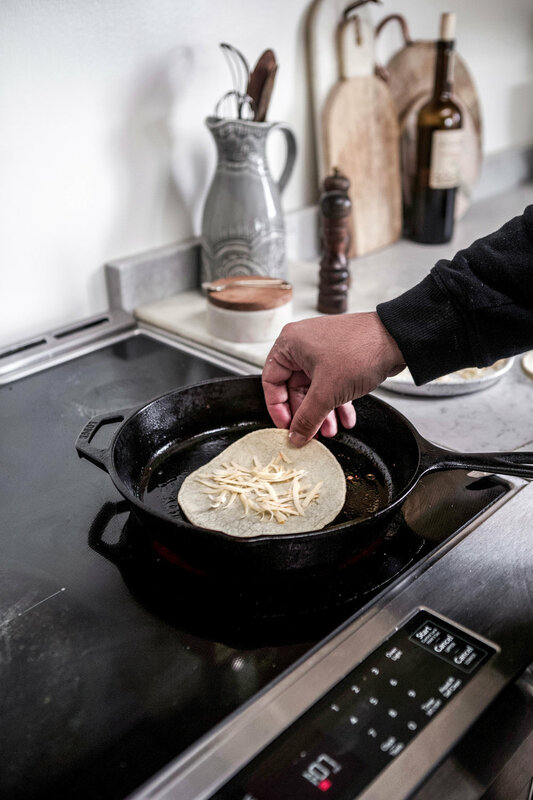 Grate some gouda cheese, add a splash of oil to the pan, sprinkle a little cheese onto a tortilla and place into pan, moving around and warming up the one side for 10 seconds or so, then gently flip so the cheese side is facing down (pics below). This takes a little finesse but once you get the hang of it its pretty easy. 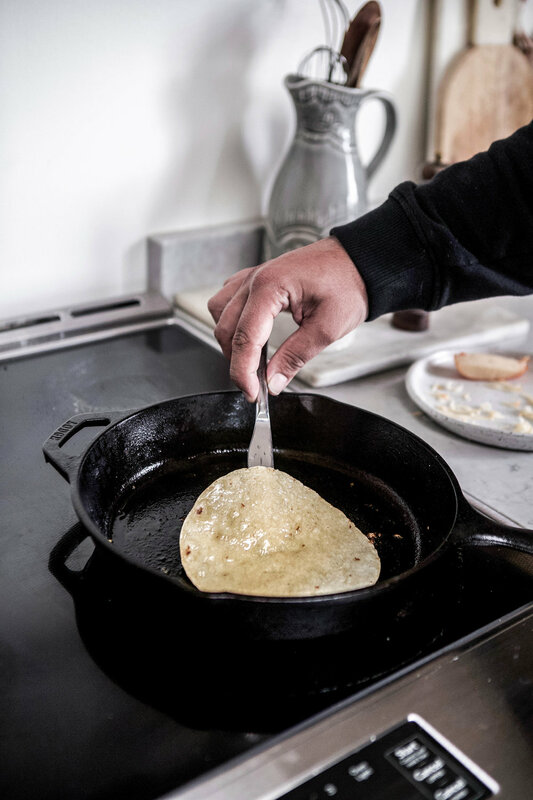 Gently and continuously slide a knife under the tortilla so the cheese doesn't stick to the pan, once it has melted flip the tortilla over onto the other side for 20 seconds or so. Serve immediately.